I'd recommend getting your neurologist to confirm that whatever caused your visual field loss was an isolated event (I'm afraid I haven't read any of your previous posts so am not sure what the cause was of your stroke). My understanding is the DVLA need confirmation that the event is not going to happen again. For me all my brain MRIs were clear so they could see that I had no other malformations and as no clot was ever found they knew it wasn't an ischemic stroke so there were no concerns about me having an increased risk of having a stroke in future. I suspect my age (in my late 20s at the time also helped). Unless you can provide evidence to the DVLA that you are not at an increased risk of it happening again I think they will be reluctant to consider you for a licence. But it was all organised by the DVLA. F﻿eel free to contact them about information about the assessment - I can't remember many details other than what I already said in my pp. I just had to drive a dual carriageway, around various A & B roads, through a small town and then do the exercises they gave above. I was not all﻿owed to practice in any vehicle before hand (I was sent a driving licence valid for one day only for the t﻿est and I had to hand it in at the end of my assessment). This advice is taken from the Quadtrantanopia thread and the quote is from BTG member Hoofbeat sharing advice on reapplying with a visual condition , more can be found on that thread and it is recommended you read the entire thread. The test is done with both eyes together as if you were driving, this actually means if one eye has a field defect the other eye may well have vision covering that patch of the visual field so it is ok. It does take a bit longer than a normal field test but is not scary, you do have to concentrate and just keep alert! The DVLA do allow for some missed spots of light but their worry is if there is an area with a patch of several missed spots close together. I was not allowed to tell the patient the result of the test, we had to send the results in to the DVLA and they made the decision. I had the test done myself before I started to drive again following my SAH for peace of mind. I read the posts regularly with great intere﻿st and follow everyone's progress, but don't often write in myself. In May 2018 , as part of my personal injury case, I was referred to a consultant ophthalmologist by a neurologist who then tested me and told me not to drive and to inform the DVLA ! I couldn’t believe it- I went straight back to specsavers who did the same visual field test and frustratingly they said that because the area of loss had not changed over 18 months they would not feel it necessary to tell the Dvla. Since then I have had to return my license and it is very apparent that I will never pass any visual field tests because I have a permanent brain injury. I just wondered if anyone had any advice- I am due back at the hospital to see the ophthalmologist in August- do I try and get him to approve a re-application? Do I go back to the neurologist? I am completely devastated by this loss of my license- any help would be gratefully received. welcome and really glad the shared experience on driving is useful and is giving you hope. I personally would go back and see a neurologist and seek their opinion on this as think their view will be crucial in getting DVLA to consider any exceptional circumstances as they will seek advice of the neurological specialist. I am hoping Johnnie M or Hoofbeat read this question as they have been through the process and may offer some valuable suggestions. But keep the faith! Thanks for that advice- I will try and contact the neurologist to show him all the evidence I have that my vision loss is stable and I have adapted to it. Welcome Finollie. It sounds like a right old muddle to me. You must be so frustrated, not surprisingly in the circumstances!! Specsavers are the people that DVLA revert to for the initial visual field test (called an Esterman test) after the loss of vision. If it were me I would be hanging my hat on that test and applying for a new licence using, as you mentioned, the exceptional case rules. I attach a part copy of the letter (inc the exceptional case rules) that were issued to me when my licence was revoked in November 2016 following a poor result with Specsavers. If you apply the DVLA to have your licence reinstated then the first thing they will do is to send you to Specsavers for a test. This may result in you getting your licence back without any further ado and the licence will come back to you within a couple of weeks. If the Specsavers test doesn't do the trick they may well put your through the 'exceptional case' criteria; at which point there are some hoops through which one must jump. See attached list of criteria, all of which must be passed. Item 1 you have already passed so this is merely a date which you'll have to inform them in the accompanying letter. Item 2. You will need a letter from your doctor/consultant confirming that the 'event' was an isolated incident and there are no other reasons why you should have a similar 'event' in the future. You may already have a letter that shows this. Items 3, 4, 5 and 6 can all be dealt with by way of an appointment with a neuro opthalmologist. The DVLA will send you a letter asking you to make an appointment with such a consultant (they will choose one in your area - it may take 2 - 3 months to get an appointment!) and they will cover these areas and report back direct to the DVLA (they will do another, perhaps more rigorous, Esterman, field of vision test). Item 7 requires a letter/report from your doctor and/or an occupational therapist that confirms that you are able to do everything in your everyday life without the loss of vision causing an issue (getting dressed, cooking, going shopping, crossing the road etc etc). Once you have passed all these above criteria the DVLA will ask you to attend a driving assessment. It sounds like you'll pass with flying colours. I am pretty sure that the DVLA will let you have your licence back but you need to apply for it back. Out of interest, who revoked the licence? Was it the DVLA? If so, have they not issued you with a letter revoking the licence? If not, I would call them directly and speak to someone about it. If you have a case number then have that to hand as you'll need to quote it. If not then just tell them what you've told us. It all seems a bit of a nonsense to me. The DVLA is the ONLY arbiter of whether you can drive or not. Call them on 0300 790 6806. Thanks for your advice Johnny- I must say that your story is absolutely inspirational and has given me a glimmer of hope in this seemingly never ending battle. Yes it was the Dvla who revoked my license at the end of May- a truly devastating day as I’m sure you understand only too well. I felt lucky that I had not lost my sight but my reading was affected ( acquired dyslexia) - now much improved.! Anyway, after this head injury I had to surrender my license and was unable to drive for 9 months. It was an amazing day when I got my license back in March 2017. No mention of having to have a vision test from the DVLA because it wasn’t a symptom of the brain injury that I was aware of even though it must have been there all the time. In October 2016 , before I got my license back, I had to go to Specsavers to get new glasses so I had a sight test. It was at this point that they told me that there was right sided periferal loss but I wasn’t told to inform my Gp or the DVLA so I had no reason to worry about it. In February 2018 I had an appointment with a neurologist as part of my personal injury case and I mentioned that this vision loss had been found ( silly me!) - he referred me to an ophthalmologist who tested my eyes and promptly told me to stop driving and inform the Dvla! I did so and my license was revoked after taking the Specsavers esterman test in May. Devastating. Im slightly concerned that in my letter from the Dvla there is no mention of trying to get my license back via the exceptional rules route? I feel that I should have a good case - it’s just getting the evidence. Ive contacted my case manager who has been in touch with the neurologist to try and get back to see him hopefully to get some evidence from him? 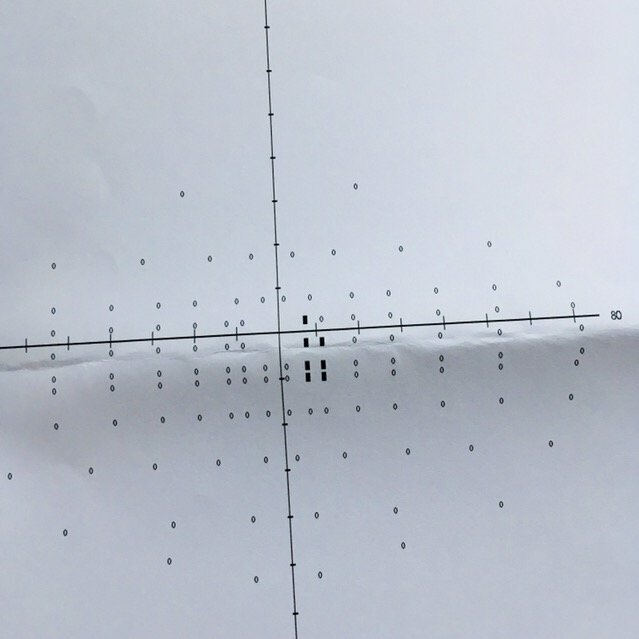 I’ve got to see the ophthalmologist again in August so I will present all the Specsavers field test printouts from the last 18 months that show no change in my vision and hope he agrees. What else can I do? I did have an occupational therapist who has discharged me - perhaps contact her? I also have a clinical neuropsychologist who has one last appointment with me next week- ask him too!! Amazing how many ‘ologists ‘ I have working on my case!!!! sorry that this is a long rambling reply- one last question- did you ever manage to pass the field test? I know I will never be able to pass it - my injury is permanent now. Thank you you for giving me and my family a bit of hope. Finollie. If I now reading things correctly, you have had your licence revoked AFTER you had the Esterman test at Specsavers in May 2018? If that is the case then you need to get on to the DVLA to let them know that you would like to understand if you will be able to apply for your licence back under the exceptional case rules. I have already posted what those rules are in my last post but you wont be able to apply using these rules until you are 'event' free for a year. Since you have already been event free I would suggest that you call DVLA and find out what it is you can do to get your licence back. I never passed the field of vision test to get my licence back and probably never will; hence the need to jump through the exceptional case hoops! So long as things are done methodically I was always of the opinion that I would get my licence back. And I did! I wish you all the best with it. Always ask more questions if you need to. Well I’m still ‘jumping through hoops ‘ to try and get my license back and getting extremely frustrated with the whole process. I’ve had verbal confirmation from my consultant ophthalmologist that he feels my field vision has improved and he sees no reason why I can’t drive but getting anything on paper that the DVLA will accept is a totally different matter. I’m going to an eye hospital this morning as part of my personal injury case ( medical legal appointment) so I’m really hoping that some useful evidence will come out of it. !Has anyone else really struggled to get the DVLA to understand what the exceptional rules are and that they exist for people who can’t pass a field vision test? So frustrating. I just want to drive again. Any advice/ help would be gratefully received! Sorry to hear that things are not progressing. Why can your consultant opthalmologist not give you a letter confirming that 'in his opinion' you should be able to drive? It seems weird that he wont do that. Have you asked? Once you have a letter stating as such from him then issue this to the DVLA and ask them to open a case to consider you for getting your licence back under the 'exceptional case' rules. You don't state what it is that you have done so far with the DVLA or what it is that the DVLA said in response. Always put everything in writing so that you have a paper trail. Not so necessary after you have a case number confirming you are being considered to get your licence back but would be useful at this stage. You are unlikely to get your licence back if the loss of vision is 'hemianopia' (half your peripheral sight). If the loss it classified as quadrantanopia (roughly a quarter of your sight) then there is a good chance. Are you able to post your Esterman test results here? I posted a PDF file of the exceptional case requirements in a post above here. Read them carefully and see if you can tick each of them off. If you can get all the tests and reports together and can show that the event was a one-off, perhaps you can then send them to the DVLA and ask for consideration to be made for you to get your licence back. You need to take the bull by the horns I'm afraid and fight your corner. Show them absolutely that you can reach all their criteria! You can do it! Just back in from my private eye consultation in Manchester- very thorough but again a frustrating experience! It seems consultants are reluctant to commit to a written statement- I took the exceptional rules list we have been sent from the Dvla saying all we need is confirmation of adaptation to my visual loss as I fit all the other criteria- can’t be any more direct! We got the visual field test results from today ( no change from all the others I’ve had ) so that will go off to the Dvla with yet another letter. I ring almost every day , my case manager rings once a week - brick wall. I will try and put a picture of my field test on once I’ve shrunk it down! Thanks for your support and advice. 5) No other impairment of vision - Your consultant opthalmologist should be able to confirm this. It seems to me that you just need to get your doctor (or, if he/she is not prepared to provide a letter, an occupational therapist) to confirm that, despite your visual defect, you are able to go about your normal daily life without a problem. It's about getting dressed, shopping, crossing the road, getting to and from work or other places that you frequent etc etc. My doctor wrote a letter to me for forwarding to the DVLA. It seems to me that there is a good case for you although I note your vision loss is right in the middle of your field of vision. I am not sure if this might be negatively viewed by the DVLA. PS. I had a letter from my consultant stating that she 'supported my application to get my licence back'. She would probably never write that I should have my licence back as she recognises that only the DVLA can make that decision and they must apply their own rules. She could not possible know the fullest extent of their decision-making criteria. Had a great email from the Dvla this morning- they are letting me do a practical assessment!!!!! All our hard work is hopefully paying off! If anyone has any advice about the driving assessment/ what it’s like etc , I would appreciate it! That is, if I may say, wonderful news Finollie!! Yay! We have lots of advice on the practical assessment but we can let you know more when it is in the diary. Once you have applied then make sure you ask the assessment centre for a cancellation. Let us know where you'll be doing it as someone here may already have attended that centre. I did mine in Carshalton in SE London. It may also be sensible to ask the DVLA if you could have a provisional licence until you get your assessment done. I had one for about three weeks before my assessment and it really helped my confidence on the road and particularly enabled me to pinpoint if there were deficiencies of which I needed to be aware. You'll have to have L Plates, always be accompanied by someone who has had a clean licence for 3 years + and you cannot go on Motorways. Give them a call and see what they say. Come back here when you have a date for the provisional and we can tell you all about the assessment. Excellent end to my working day!! Thank you Johnnie! We are so pleased that the never ending banging of our heads against the Dvla wall is having some effect! The 88 page report compiled by the private Opthalmic consultant seems to have had an immediate impact- he was very clear that I should have a practical test. My test will probably be in Chester. I will ring the Dvla tomorrow to ask if it’s possible to get a provisional licence before the test- the form I’ve filled in clearly states it’s just for the test. Thank you for all your support and positive comments- appreciate it. Well the amazing day arrived today- my assessment!!!!!! I had to go to a centre in north wales to do it but I didn’t care!!!!! I’m pleased to say that I did really well and I was told that their recommendation is that I can have my licence back! Still won’t be 100% ecstatic until my licence arrives through the letterbox but there’s absolutely no reason for the Dvla to refuse it . It’s been a roller coaster of emotions, frustration and anger since I lost my licence but this is amazing! Can’t wait to get back to driving again- freedom! What a fantastic thing to read on my way to work Finollie. I am so pleased that all went well and by the sounds of it you are a few short weeks away from being mobile again. I always liken it to the day that you got your first bicycle as a child. Freedom of the open road. Freedom of movement. Freedom to go wherever your heart desires without recourse to bus, train or tram timetables! I still get a joyful feeling each time I get into my car, even if it is just for a trip to do a weekly shop. When I first bought a TVR (I don't have it now but did have it for 7 glorious years), my wife asked me to pop out for a pint of milk. It took me two hours and around 60 miles to get that pint. Luckily she wasn't hankering for a cup of tea, otherwise there may have been something to answer for! The next stage may be somewhat frustrating. It will take the test centre up to a week to issue their report to the DVLA (Call them and ask them to fax it to the DVLA as well as posting it - it will speed things up). Once the DVLA have it, it will take up to five days to 'get on their system'. I suggest you chase up the test centre after three days from the date of your test. Once they have confirmed that the report has been faxed to the DVLA, chase the DVLA around four days after they have received it. It is then in the lap of the Gods as to how long they take to report to you that your licence is returned. If you have a case manager, phone them every day after you know that it is formally on the DVLA's system. They are really nice about it and generally very helpful. One day soon you'll hear them say that they have approved you having your licence back. It is a glorious day and I am looking forward to hearing all about it. You do not have to wait to get the licence in your hand! Just make sure that you ask them if it is OK for you to drive and get the name of the person that said it, just in case of confusion somewhere along the line. From a practical point of view, call your insurers and make sure that you have insurance agreed and ready to go once you have your licence returned. I did this and was able to give my insurance company an email to say that I was allowed to drive again. Once they received the email my insurance was valid from 12 midnight of the date of the email. Hence, I was ready to go! Thanks so much for all your advice and enthusiasm! Can I ask- did your insurance premium go up as a result of losing your licence? Finollie, I don't know of anyone that's had their insurance premium increased because of the SAH. I believe that insurance companies cannot increase your premium, if the DVLA has said and given the okay, that you're fit to drive ... Your insurance company may want to see the copy of the letter from the DVLA, telliing you, that you are fit to drive. It's much better to declare your situation, rather than having an insurance company not paying out, when you need it ...I would always advise for anybody to declare their medical history to their insurance company, irrespecive of having your licence revoked, as they would perhaps refuse to pay out. I never had my driving licence revoked and declared my problems voluntary to both the DVLA and Insurance company. At the time of my SAH, I had a work colleague, who unfortunately had a brain tumour, but gave sage advice. I had a third nerve palsy to my right eye and seizures during my spell in hospital...some of those seizures were the hospitals fault with their lack of due care and attention. A third nerve palsy meant that I had double vision. The DVLA were happy for me to drive, as long as I corrected the double vision with either an eye patch or glasses fitted with a prism, when driving. I believe that if you've been declared fit to drive and it's been confirmed by the DVLA and you have evidence as such, that insurance companies can't discriminate and up your premium. Thank you to all of you for your help and support. I was really convinced that my insurance premium would go up so it’s great to think that this may not happen. I will let you know when the precious licence arrives through the postbox! The amazing news that my full driving licence was mine again was emailed to me at 6.15am today from a very efficient and helpful member of the DVLA team!!!! Contacted my insurance company and just as you said, I had my insurance reinstated free of charge immediately. Needless to say I have already been out for a couple of short local drives and the sense of freedom is indescribable!!!! Thank you to all of you on this forum for the advice and support- I will never forget it. Fantastic news Dave. Another success story. Be careful out there in the snow! I had a bleed from a left occipital AVM. Although this caused awful headaches and confusion, as the swelling subsided, so did the symptoms. I had surgery over Christmas and New year 2017-2018 and have now been left with a right homonymous quadrantinopia. The only time I am aware of this is if my small dog approaches my right foot! I can read, sew, cook, play netball etc with no problems at all. The only thing I can’t do is drive as my licence was revoked due to brain surgery. This was an initial 6 month ban but I had an intra operative seizure (very common apparently if some is poking around in your brain!) which meant I was on anti convulsants post op. I stopped taking these in sept 2018 as I felt I didn’t need to be on them. There was a general lack of guidance as to when I could come of them so my GP and I made a plan to wean off. I notified dvla and provided them with my surgeons/drs details and they did contact them. So far so good. I now want to reapply for my licence as not driving is unbearable as well as inconvenient and stressful. After speaking to dvla twice in as many weeks, they maintain they only have info on my surgery not my visual field issue! I’ve paid for my own Esterman test and will send this with my reapplication. My concern is that I’m sending a application form, a sealed copy of my Esterman test from spec savers and a medical declaration form from the dvla website. All have different postcode destinations in Swansea so I’m not sure which one to choose. Does anyone think they’ll accept my forms as I’ve taken it upon myself to get tests and send them in or will I have to do them again at dvla request? I know I’m borderline with Estermann (missed 2 adjoining spots in one test and 3 in another) but it’s so frustrating when they don’t take into account you can move your head in ‘real life’ and see everything! I found this site and was cheered by positive stories from others who have managed to get their licences back and I’m hoping that I can be one of them.